He died 2,000 years ago on a cross. There was no CNN, no internet, no newspapers,radio or television. No Twitter or Facebook. No Instagram,Skype, or Google. Nevertheless the message of the man who died on Calvary (The Place of the Skull) spread around the world without mass communication. His followers, twelve of them were so devoted to His message of love and code of behavior they became the first pacifist activists who spread a message the man they called their Lord had preached to them. He was Jesus of Nazareth. He had no last name. Today He is now known all over the world for the message he delivered. Whether you believe He is the Son of God, or not, he ranks as one of the foremost influences on mankind. More than Plato, more than Socrates, more than any leader or politician, or entertainer whoever lived. His selfless acts of embracing lepers, the poor, those who sinned were unique. Such compassion for the downtrodden was unheard of during the time He lived. It was a time of slavery. No human rights. No care for the sick. When cities were razed and populations slaughtered or enslaved much like the genocides of today. Jesus of Nazareth introduced a new philosophy that spread throughout the world after His death by crucifixation on this day (maybe, we do not know the exact date), because the community leaders of his own people thought him a threat to their power. And that should be a lesson to us all. If you live by His philosophy of foregiveness you are a person at peace with yourself. If you accept those who are different from you without fear or prejudice, you are a force for spreading His message of peace towards others and good will. I f you help the poor and the sick because you sympathize with them, you are following His way. If you stand up for truth, point out what is wrong as He did with the Pharisees. You are doing his will. If you go about doing good for the sake of doing good, you are following His virtue of selflessness. Jesus of Nazareth’s message whether divine or a code of how we conduct our lives resonated with millions and it spread. There is no denying He is one of the great philosophers of the human experience, kin to Socrates, the other giant of antiquity thought. 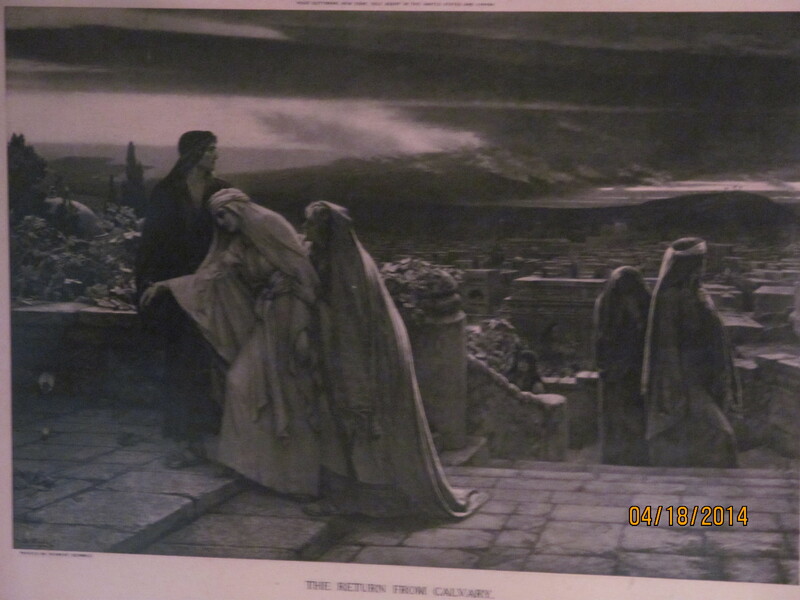 The above print of “The Return from Calvary” painted by Herbert Schmalz shows the last hours of Jesus of Nazareth’s crucifixation around 33 A.D. on Calvary Hill, “the place of the Skull” outside of Jerusalem late in the day He was crucified. 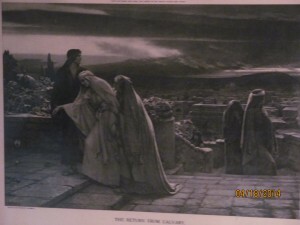 The darkness which was on the earth (during His suffering) is clearing away. One long, dark cloud is hanging over the city like a pall. The Virgin Mother, weighted down by fatigue and grief, knowing not wither she goes, is being led up some steps, toward “his own” home, by St. John and Mary Magalene. In the distance on the top of Cavalry, you can make out the three crosses. The grief so eloquently captured by this print depicts the very personal loss all of us endure when someone we love passes away because of all they did for us. Jesus of Nazareth was a human being who affects us to this day. One of the great gifts of this man, Jesus of Nazareth, is the celebration of humanity and capacity to care and feel for others that aids persons whether they believe He was the Son of God or not. Or that you will have eternal life if you believe in him. His philosophies of care, courage, compassion and benevolent action serve their practioners well because they leave a great personal satisfaction in the heart, the mind, and the spirit. You do not have to second guess yourself, when you do what is right, humane, merciful, and serves the less fortunate without superiority with nothing to gain for yourself. And if you do not do what is right, if you weaken, you always regret it and remember when you failed to do right. The peace of mind of action is the least of the great gift of Jesus of Nazareth whose death on the cross is marked this day. If you act as Jesus did, you will be remembered by all you meet fondly and lovingly, and be comforted that you will live in memories of those you have touched with your love and kindness and caring for eternity to the end of the age. His simple teachings have great power. Use it. They give meaning to our mystery of life.